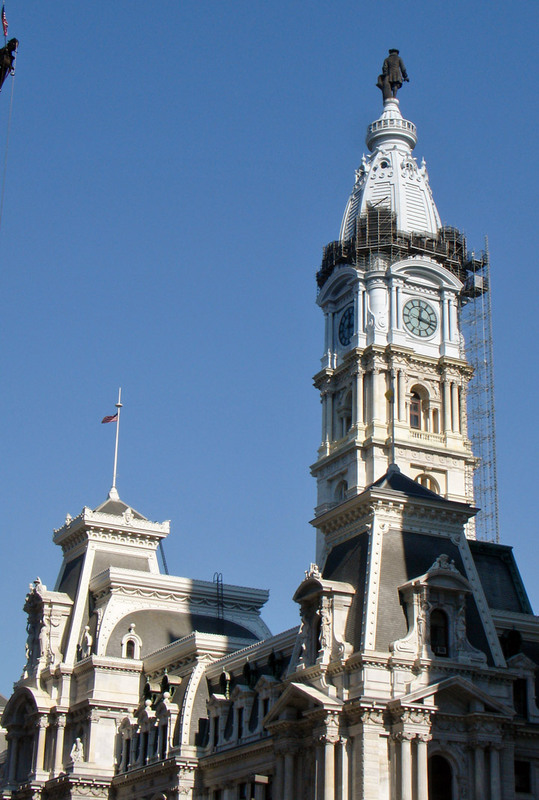 Although City Hall construction began in 1871, the building's history can be traced back to Philadelphia's founding. When William Penn envisioned his City of brotherly Love in 1682, he planned a city that would stretch for approximately one mile north and south between the Delaware and Schuylkill rivers. 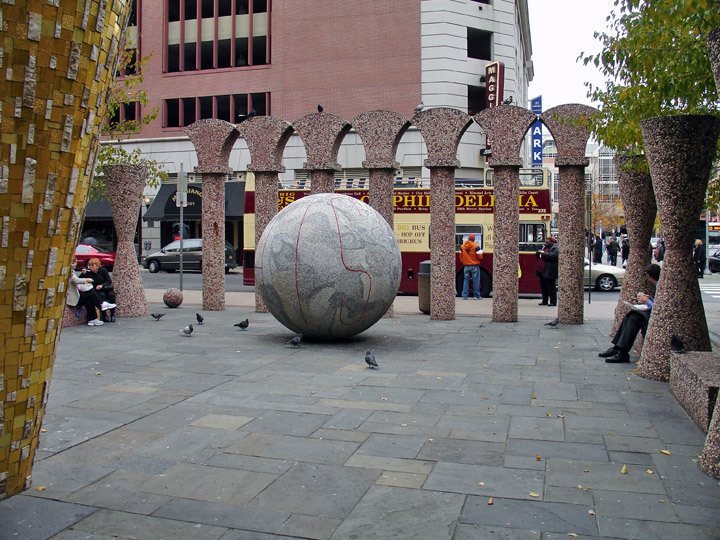 Penn's plan set-aside five parcels of land as public squares with centrally located "Center Square" reserved as a site for public buildings. Despite Penn's design for a city that would stretch from river to river, early development in Philadelphia was concentrated along the Delaware riverfront, spreading north and south beyond the original city limits. The buildings that functioned as City Hall were, therefore, sited in the neighborhood currently known as Old City. One building used as a City Hall was located at the head of the city market at 2nd and High (Now Market) Streets, while Center Square remained countryside, awaiting the City's eventual westward expansion. 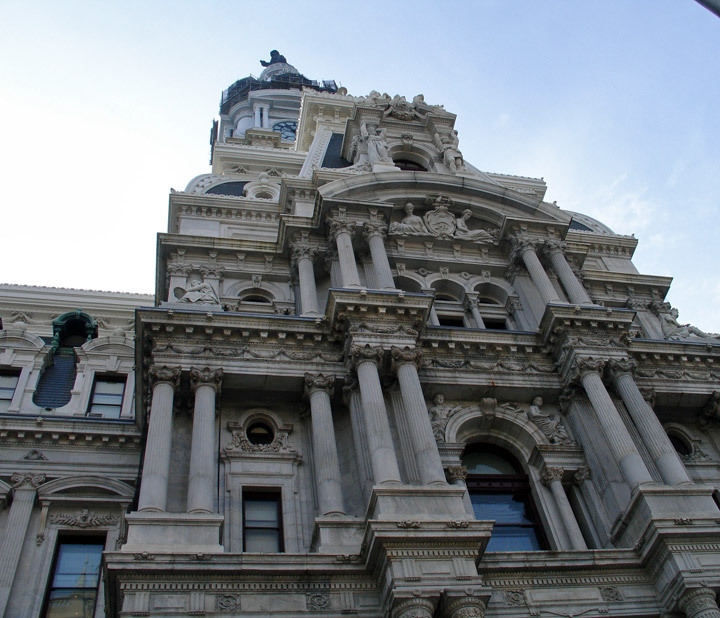 City Hall is both an historic, architecturally significant building and the functioning home of Philadelphia's city and county offices and courts. 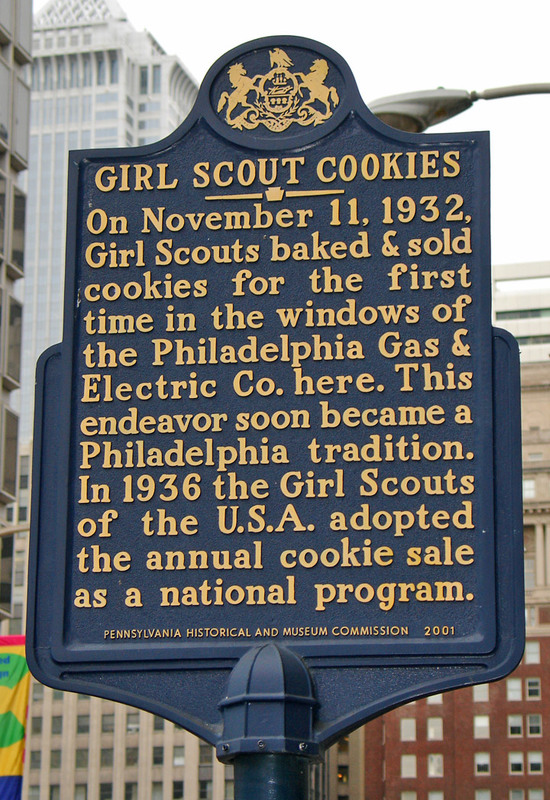 It is located at the intersection of Broad and Market Streets, in Center Square, the center of downtown Philadelphia. This is one of five squares included in William Penn's original 1682 plan for Philadelphia. City Hall is the center of Philadelphia's government and politics, and has been the focal point of Philadelphia itself for more than a century. 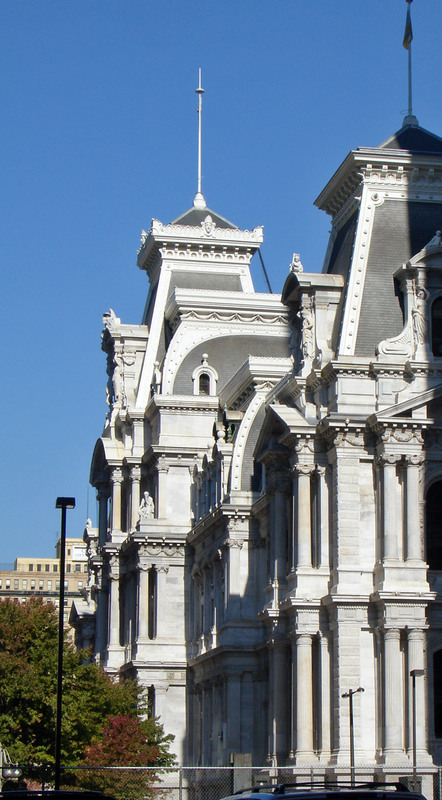 Planning for Philadelphia's City Hall began before 1870, when a commission was established to oversee the construction of new public buildings. After much debate and several design competitions Center Square was selected for the location. The commission chose a Scottish architect named John McArthur, Jr. to design the new building. 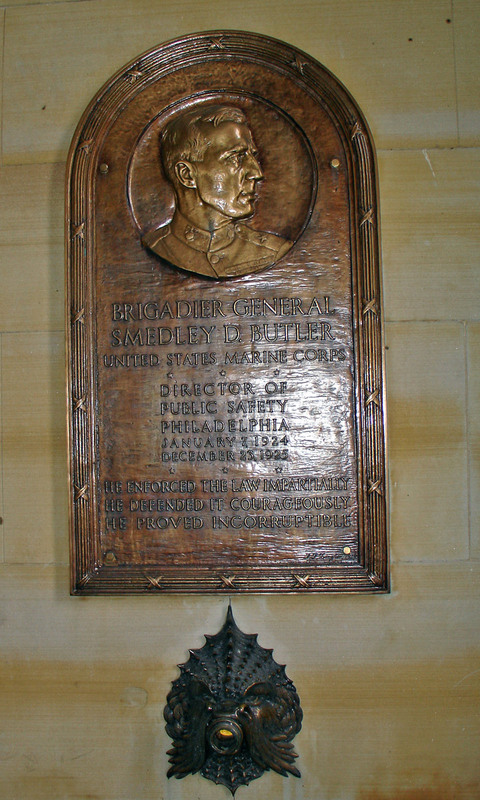 Work began in 1871, and the building was completed thirty years later in 1901. City Hall's architecture is of the elaborate Victorian style referred to as French Second Empire. The Palais des Tuileries and the New Louvre in Paris influenced the building's design. Second Empire motifs are evident in the turreted courtyard stair towers; the slate mansard roof with dormer windows; the paired columns, which help to make it look three stories instead of eight; the integration of the hundreds of sculptures; the projecting corner pavilions; and the grand staircases in the North and South portals. City hall's style is also often referred to as High Victorian Picturesque Eclecticism or French Renaissance. City Hall is a square building arranged around a central public courtyard. Its four exterior facades are all of similar appearance, and include the four monumental arched portals leading to the courtyard from the outside. The north façade is considered the ceremonial "front "of the building. The north side is also where the famous tower is located. 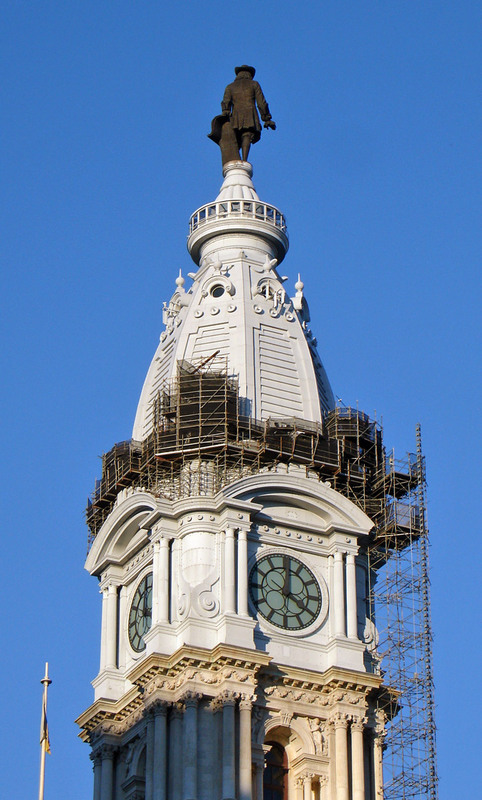 The tower rises 548 feet above the ground, terminating at the top of the hat on William Penn's statue. Just below the statue is the visitors' observation deck, approximately forty stories above the ground. There are massive twenty-six foot diameter clocks on all four sides of the metal portion of the tower. Below this area of the tower and throughout the remainder of the building are walls of solid brick covered with white marble and granite. The walls supporting the tower are twenty-two feet thick at the bottom. The building is one of the world's tallest and largest all-masonry, load bearing structures without a steel or iron frame. 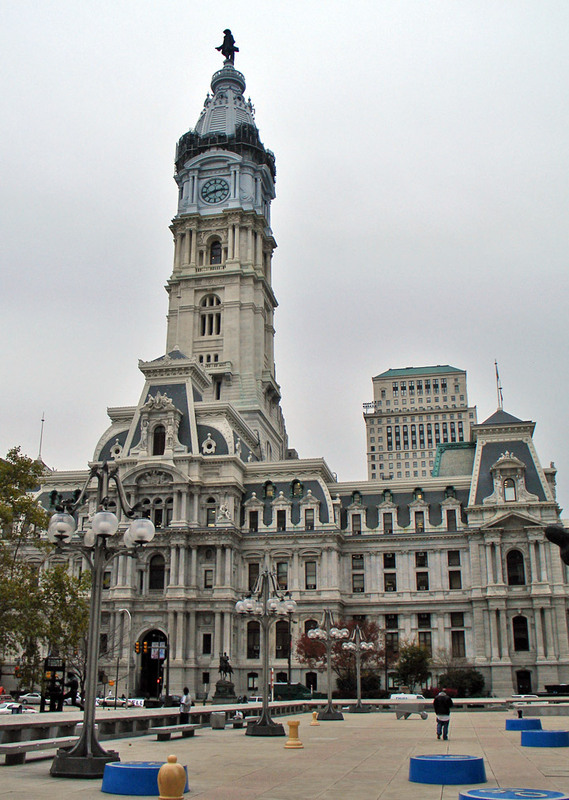 To reflect Philadelphia's importance, McArthur intended City Hall to be the tallest structure in the world. Unfortunately, City Hall never held that title because the Eiffel Tower and Washington monument were both completed before City Hall and both are taller than the building. 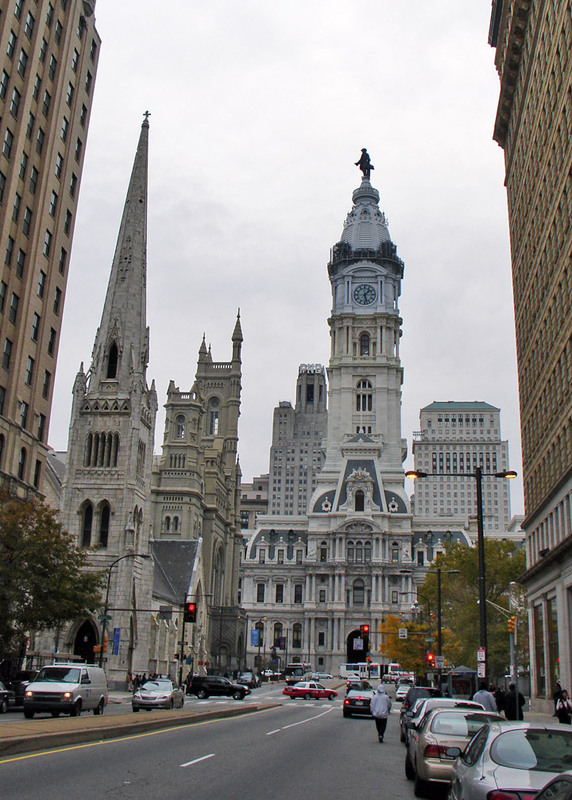 Since neither of those structure are true buildings, Philadelphia's City Hall did remain the tallest occupied building until 1909, when New York built the Metropolitan Life Building. 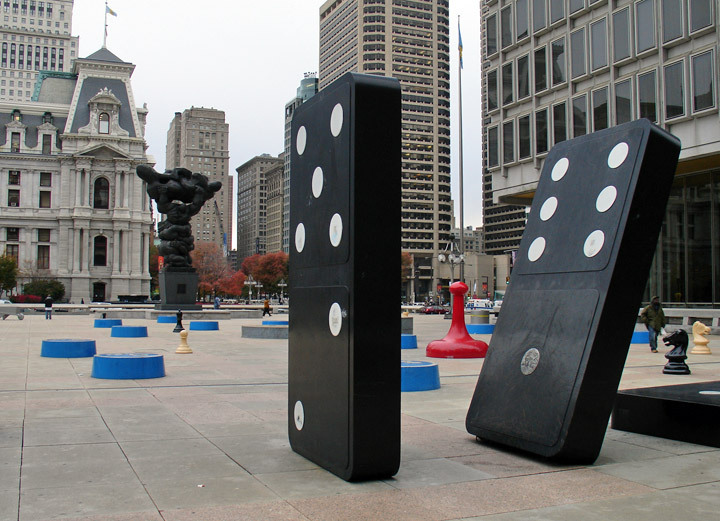 It was, however, the tallest building in Philadelphia until 1987, when a long-standing "gentlemen's agreement," discouraging constructing higher than Penn's hat, was broken with the construction of the sixty-one-story Liberty Place. 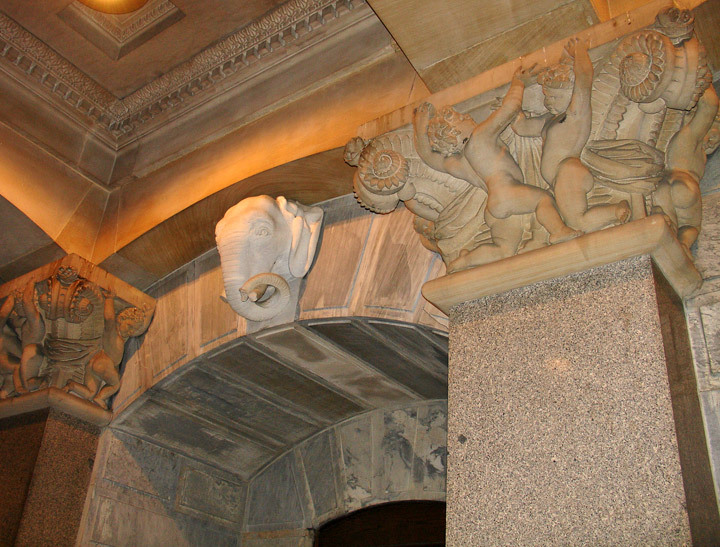 On of the most remarkable features of City Hall is its many sculptures. 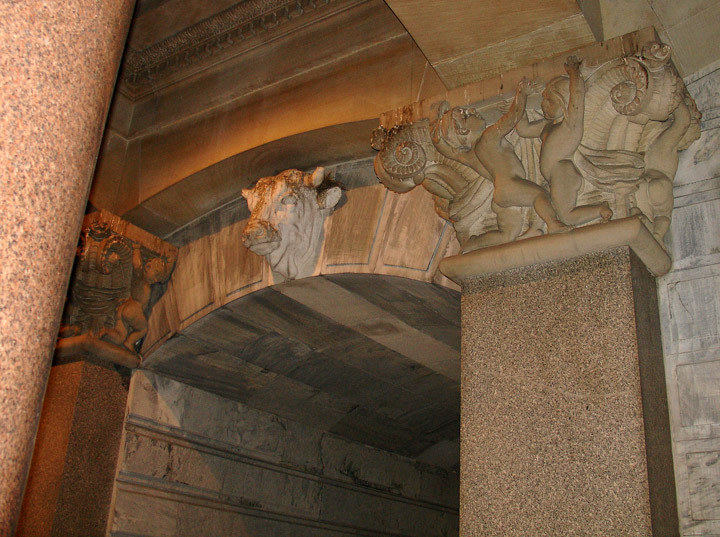 Inside and out, the building has over 250 relief and freestanding sculptures, all created by Alexander Milne Calder. 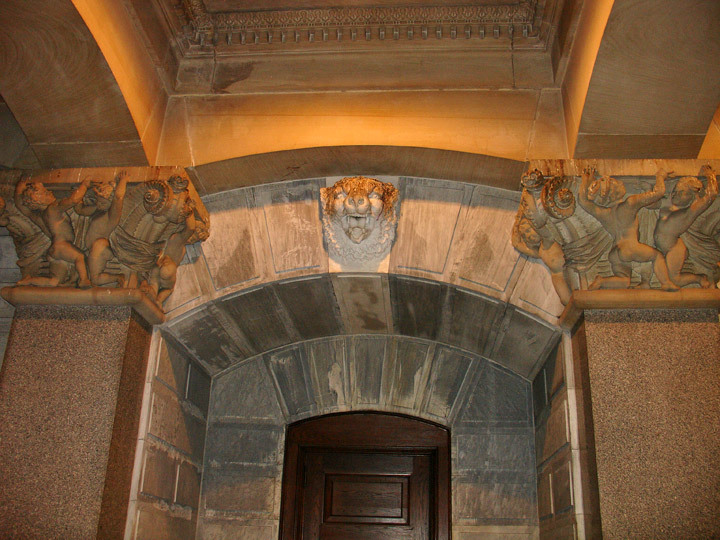 The original clay designs were sculpted and cast in plaster in the City Hall basement studio. Next, the plaster forms were copied by stone carvers in marble. Nine large figures were cast in bronze. The sculptures represent a wide range of topics, including historical, allegorical, mythological, people and animals from throughout the world, and figures that symbolize wisdom and attributes, virtues, and vices. 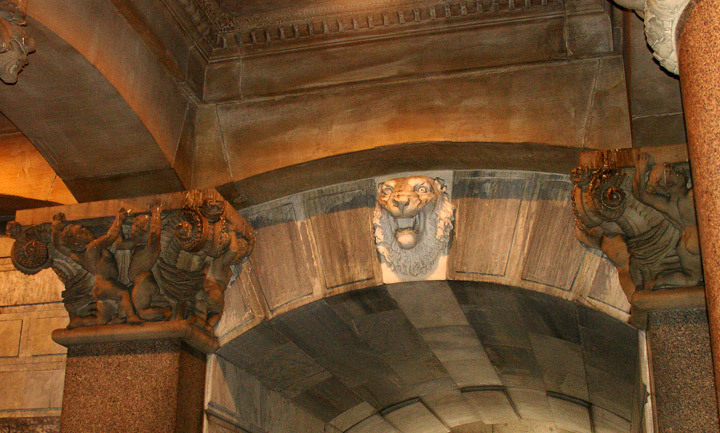 A few examples include a keystone of Moses over the South portal, representing law and justice, a pair of Swedish settlers found just above the clock level, representing the original European inhabitants of the area. This comprehensive sculptural decoration is said "to express American ideals and develop American genius." 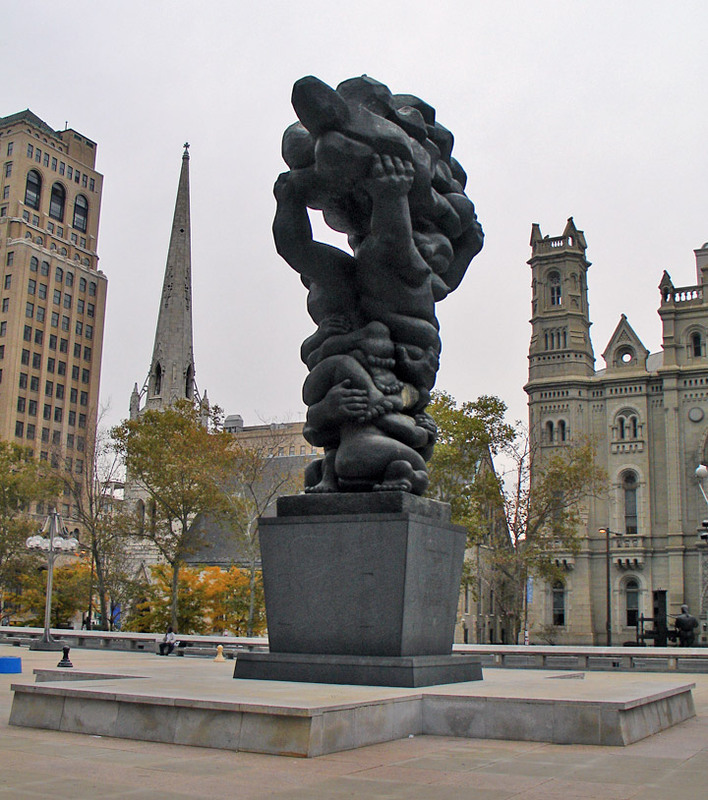 The most famous sculpture is that of William Penn. The statue of Penn stands thirty-seven feet tall, and weighs twenty-seven tons. He is the tallest sculpture on top of any building in the world. His five-foot long hand is pointing northeast towards Penn Treaty Park, where William Penn made a treaty of friendship with the Native Americans in 1682. The hand appears to be making a humble gesture of blessing and welcome. The bronze statue has magnificent details including decorated buttons and lace cuffs. He carries the Charter of Pennsylvania from King Charles II, which has legible words written on it. The Charter rests on a tree stump, symbolizing the first tree cut from his "Greene Country Towne." With close to 700 rooms, City Hall is still the largest municipal building in North America and maybe the world. The building houses three branches of government, the Executive Branch, the Legislative Branch and the Judicial Branch's Civil Courts. Many people come to see City Hall because of its history and architectural significance, but it is still a fully functioning municipal building. Consequently, City Hall's interior is constantly being worked with. While the hallways and many rooms have been altered with dropped ceilings and new lighting, as well as many rooms having their original walls covered with wood paneling or sheet rock, a number of the building's most important rooms have been preserved or restored.